Clinton County Administrative Offices are located at 137 Margaret Street, Plattsburgh NY 12901; phone: 518-565-4600. 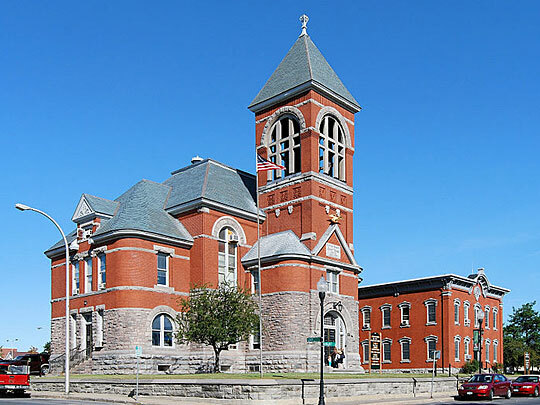 Photo: Clinton County Courthouse, Plattsburgh; Marc N. Belanger, 2008, en.wikipedia.org, accessed July, 2012. Clinton County was set off from Washington County March 7, 1788. The first county judge was Charles Platt; the surrogate, Theodorus Platt. The first district attorney, John Palmer, was appointed in 1818. The first white man that ever visited this county was Samuel Champlain, in 1609, under the auspices of the French. From that time until the final surrender of Canada in 1760, the French claimed and held this region of the country, and the lands were mostly held by parties holding title under French grants. Settlements were made at all the principal places along Lake Champlain within 10 years after the close of the Revolution. Point Au Fer was occupied by the British until 1796, when, in common with several other posts along the northern frontier, it was surrendered to the Americans. During that same year, the St Regis Indians ceded their claims to the State of New York.